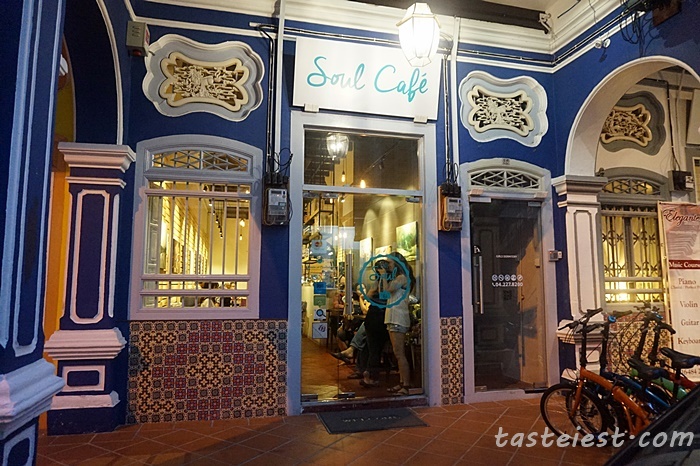 We are so excited to visit Soul Cafe again and since Soul Cafe is our all time favorite restaurant so today we have high expectation to try out their going to launch Christmas menu. 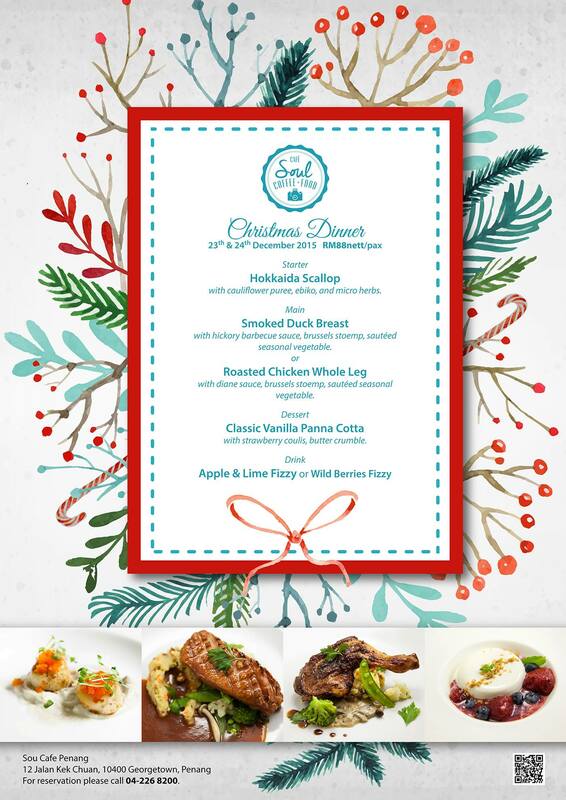 2015 Christmas dinner available on 23th and 24th December only but the pricing is definitely attractive, for just RM88/pax you and your love one can enjoy 4 course meal in such a lovely restaurant. Drinks are either Apple & Lime Fizzy or Wild Berries Fizzy. 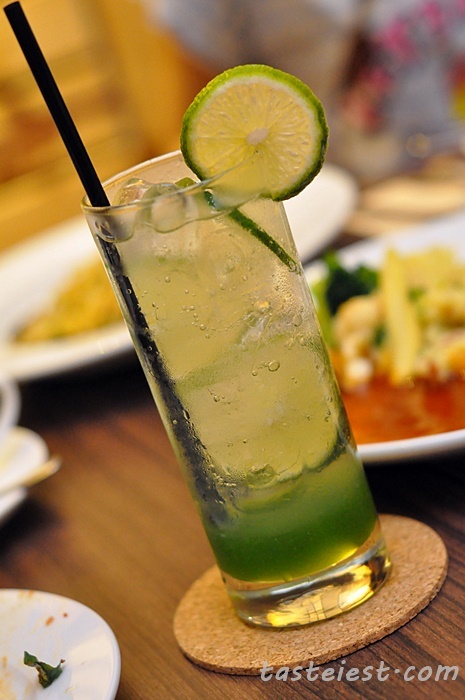 We choose to have Apple & Lime Fizzy which are extremely refreshing with a little bit of sourish taste making it a good start of the night. 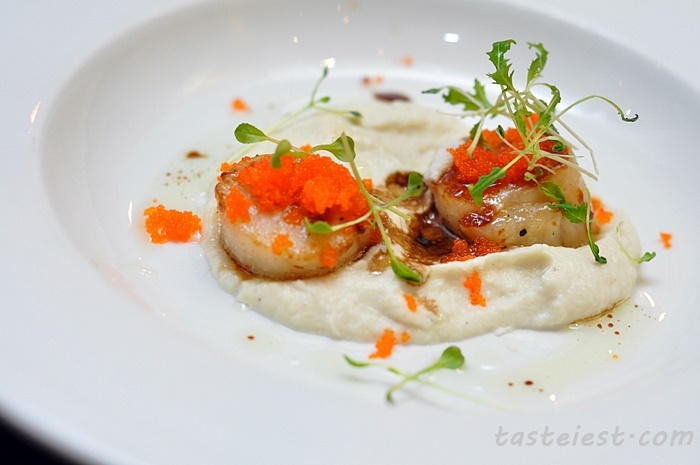 Starter are Hokkaida Scallop with cauliflower puree, ebiko and micro herbs. Two big size of scallop nicely pan fried to seal the juiciness serving with cauliflower puree that is very fresh in taste together with ebiko sauteed taste making it a well balanced starter. While on main dishes there is two option available which are Smoked Duck Breast or Roasted Chicken Whole Leg. Smoked Duck Breast served with hickory barbeque sauce, brussels stoemp, sauteed seasonal vegetable. Even without putting the duck breast into my mouth I know it going to taste good, extremely crispy skin with succulent duck meat are so flavorful. 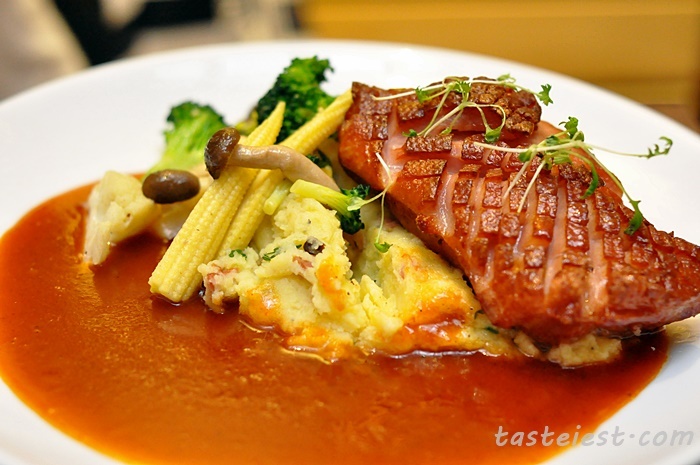 Served on a generous amount of mash potato with barbeque sauce that make it taste wonderful. 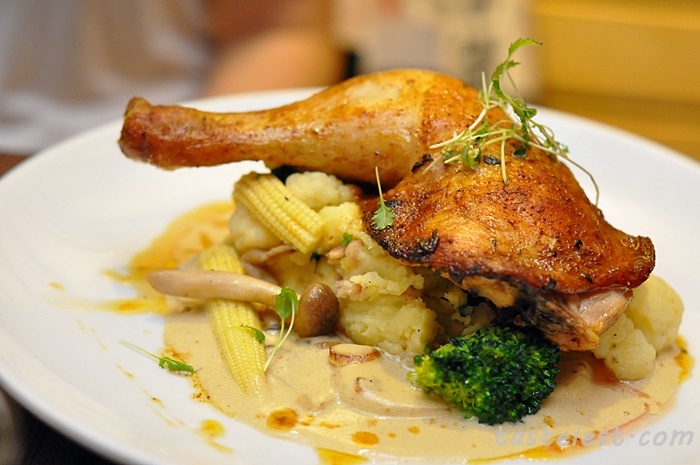 Roasted Chicken Whole Leg served with diane sauce, brussel stoemp, sauteed seasonal vegetable. Nicely marinated chicken leg roasted to perfection to create a crispy skin and flavorful chicken meat, dip with the special Diane sauce which are creamy with a little bit sauteed taste making it a perfect combination. 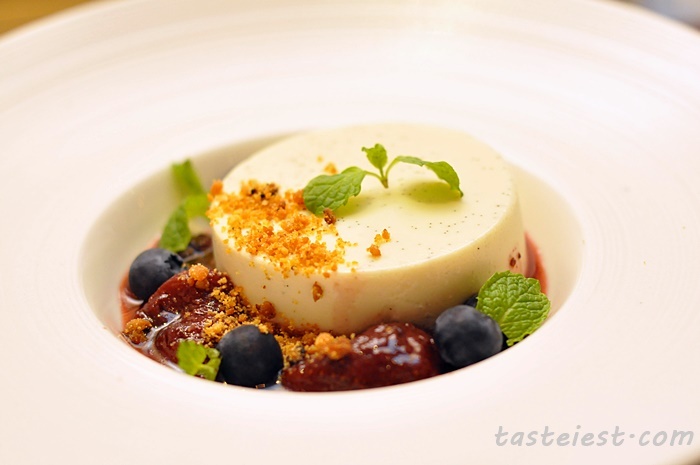 Dessert are Classic Vanilla Panna Cotta with Strawberry coulis, butter crumble. As usual, the freshly made Panna Cotta are always good, serving with Strawberry Coulis that are not too sweet are just nice for balanced flavor. Soul Cafe Christmas Menu. Make your reservation before it too late. You can join our Taste…iest Facebook Fanpage to keep yourself updated on all the latest from Taste…iest, Penang Food Blog. 12, Jalan Kek Chuan, 10400, Georgetown, Penang. If you are using Android phone, you may follow our Papago Navigation App Installation Guide for the ultimate food hunting tools. Copyright © Enqvist. All rights reserved. All content and images, unless otherwise noted, are copyrighted and cannot be used without express and written permission. Excerpts and links may be used, provided that full and clear credit is gidasdven to http://www.tasteiest.com with appropriate and specific direction to the original content.